Edited by: Katja Werthmann, Tilo Grätz. With a preface by: Günther Schlee. With an introduction by: Katja Werthmann, Tilo Grätz. With contributions by: Filip de Boeck, Raymond E. Dumett, Tilo Grätz, Eugenia Herbert, Paul Richards, Katja Werthmann. Series edited by: Thomas Bierschenk, Anna-Maria Brandstetter, Raimund Kastenholz, Matthias Krings, Carola Lentz. When valuable minerals are discovered in areas in which government control is weak or contested, artisanal mining springs up and creates new communities, new forms of bonding and alliance, and new divisions and hostilities, or new forms of Integration and Conflict. Since the beginning of the 2000s there has been a boom in studies about non-industrial mining in Africa, but there is still a lot of work to be done, especially about the social worlds. Mining and related economic activities can be profitable but also hazardous for individuals, communities and the natural environment. Whether artisanal mining can contribute to economic growth or be replaced by more sustainable livelihoods is a matter of on-going research. The regulation and enforcement of rights and obligations connected with artisanal mining vary from state to state. It is is often seen as a response to poverty, but mining is ancient in several regions of Africa, and we need to understand continuities as well as changes in order to make sense of present-day mining activities. Life in mining camps is also attractive because it empowers social uniors and offers access to alternative life-styles. The motives for taking up mining vary according to the historical, social and political circumstances as well as according to an individual’s age, gender and social status. The cases presented in this volume show studies of historical and present-day mining in Africa that focus on the social organization of mining and related livelihoods, on different actors involved in mining, and on social changes brought about by mining booms. It ranges from pre-colonial mining to the present-day industrial mining boom and presents cases from Angola, Benin, Burkina Faso, Ghana, and Sierra Leone. Dr. Katja Werthmann is an anthropologist and professor at the Institute of African Studies at the University of Leipzig, Germany. She has researched and published about Nigeria, Burkina Faso, Côte d’Ivoire and Cameroon. PD Dr. Tilo Grätz is an associate professor at the Institute for Social and Cultural Anthropology, Freie Universität of Berlin, Germany. He has done fieldwork in West Africa (Benin, Burkina Faso, Mali, Ghana) about social relations, migration and transcultural processes. From a historian’s perspective, this book contributes to the study of mining in Africa by making accessible critical breaks and continuities in the social worlds of non-industrial mining throughout many parts of the African continent, and over a large span of time – insights that are also relevant to anthropological research. Though it is by no means a comprehensive overview (there is a heavy West African bias), the collection offers a broad enough range of scholarly accounts to engage a large contingent of academics. This wide spectrum approach however, is also one of the challenges of the book. The reader has to manage frequent changes in conceptual frameworks, in addition to chronological and geographical transitions. Regardless of this, the authors succeed in providing a very diverse and dynamic picture of non-industrial mining frontiers. The collection of essays in Mining Frontiers should be lauded for opening up dialogue between Africanists of an interdisciplinary background working on different regions of Africa and varying periods of time. Insgesamt gelingt es den Autor_innen über detaillierte Beschreibungen die Kontinuitäten und Wandlungsprozesse der sozialen Organisation des Bergbaus in verschiedenen afrikanischen Ländern darzulegen. Auf diese Weise liefert der lesenswerte Band Anregungen zum Weiterdenken und verdeutlicht nachdrücklich, dass es sich bei den mit dem Bergbau einhergehenden sozialen (Wandlungs-)Prozessen um ambivalente Phänomene handelt, die sich eindimensionalen Erklärungen und simplifizierenden Bewertungen entziehen. ‘Mining frontiers in Africa’ provides a good blend of historical and ethnographic materials, set in a framework that is sensitive to both local conditions and the broader political economy of Sub-Saharan Africa. As such, it offers an overview of developments and problems and indicates important questions for future research. 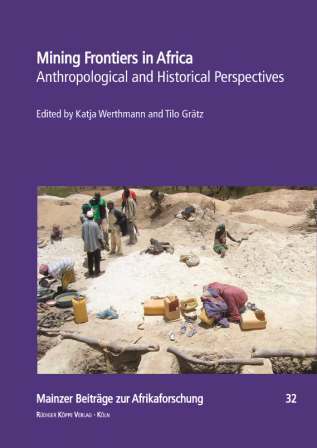 Anthropologists working in other regions, like Latin America, Southeast Asia or the Pacific – where large-scale extractive industries are also growing in importance – will appreciate the comparative dimension this volume offers as well as the editors’ efforts to link artisanal and industrial mining in a context that encompasses extractive processes in different regional anthropologies.